In this article, we are going to show you how to harness the power of smart email marketing, and personalization. The focus here being on how to quickly get your personalization and smart email marketing efforts rolling along. To do this right, we need to explain what “personalization” really means in relation to smart email marketing. What Is Personalization and What Does It Have to Do with Smart Email Marketing? “The future of eCommerce will be more personalized” – Paul Fu. Senior Director of User Experience at Alibaba. Paul Fu is absolutely correct about his assertion regarding the future of eCommerce. Hence, when we talk about personalization, we are referring to the process of customizing a shopper’s experience to cater to their unique interest. By catering to a shopper’s unique interest, you can inspire them to continue shopping with your business. Thus, generating repeat revenue. Studies have found that highly engaged shoppers purchase up to 90% more often than those who are not engaged with a business. They also spend up to 60% more on average. The answer is: Through a process that involves a combination of Machine Learning and Artificial Intelligence to deliver striking results. So, let’s delve further into the process of personalization. Where do we start on this revenue-boosting journey for our business? Sales: The products that are selling. Abandonments: The products that are being abandoned by shoppers. Within each of those parameters, you will want to create a few sub-groups for your assorted product categories. There are often other parameters to consider as well, such as how often a product is bought or alternatively, how often products are abandoned. An example of a product that has been abandoned many times and is now part of a unique product group. Once you have separated your products into unique groups based on the parameters of your choosing, what are the next steps in the personalization and smart email marketing process? Shopper Status: Logged In (registered) or non-logged in (guest) shopper. LTV: Shopper Lifetime Value: The amount of money they have spent on your site. LTS: Shopper Lifetime Sales: The amount of times a shopper has made a purchase on your site. Traffic Source: Where did the shopper come from to get to your website. 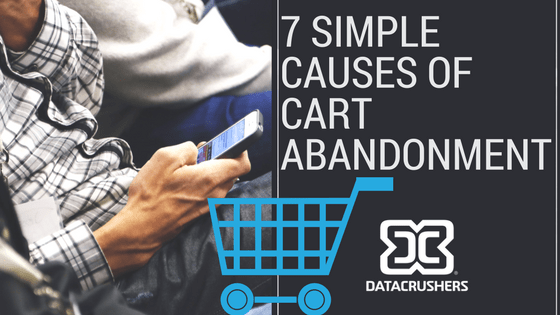 Cart Content: The products that were in their cart, as they relate to one of your unique product groups or segments. The process of shopper segmentation helps advance your personalization efforts. This is because you can micro-target shoppers based on their unique categorization in diverse groups. What Does Personalization look like In Practice? Let’s say you want to quickly clear out inventory of the product that has been abandoned the most on your site. First, you find the product in question and create a unique group just for it. Next, using the Shopper Analytics suite, you would create a new segmented based on the abandoners of this specific product. In this case, you can filter the abandoners based on all sorts of parameters. But for this example, let’s just say you want to target only those abandoners who came to your site for this product because of an affiliate link or paid promotion on a specific website. You could then further filter this group of abandoners based on the traffic source. 3) The Union of Personalization and Smart Email Marketing! This is where the fun begins. Because you know which product was abandoned, by whom, and how they got to your website, the personalization and smart email marketing process is made that much easier to complete. Hence, you will now want to create a personalized email for this segment. This is done just by selecting the “Segment Email Blast” function from your Shopper Analytics page. In the email itself, you want to remind them of their interest in this product and thank them for coming to you from the specific traffic-source. Using the “Product” component found in the easy to use Drag and Drop email editor, you can quickly select the specific product that was abandoned to be displayed in the email. Furthermore, you will want to include a specific coupon just for this product. The Datacrushers Drag and Drop editor makes everything easier. Once everything is configured to your liking, you can just send out that email blast, and watch as the revenue recovery magic happens. And that, in a nutshell, is how the personalization and smart email marketing process works. With the Datacrushers Revenue Discovery Platform, harnessing the power of smart email marketing is so simple, anyone can do it! A unique integration between Product Analytics, Shopper Analytics, and our full email stack – all backed by Artificial Intelligence and Machine Learning – ensures that your personalization and email marketing efforts are truly going to be smart. But not just smart, simple to use as well! So, if you are not already using the Datacrushers Revenue Discovery Platform, what are you waiting for? Hit the banner below to get your personalized, smart email marketing campaigns started today!